The Lateral Force Unit (LFU) is a second independent measuring head which allows additional to the normal loading of a surface the application of lateral forces like they occur in many applications. Especially in combination with stress calculations can this be used for a better simulation and understanding of failures in surfaces. The displacement resolution is as good as in normal direction. The fore resolution is somewhat less accurate because the spring force of the holding springs has to be considered. The patented principle of the LFU is explained in fig. 1. 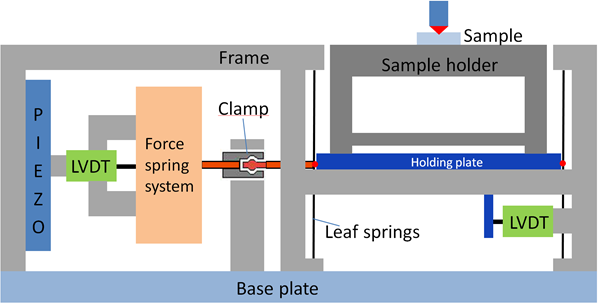 The sample holder is sitting on a holding plate which is fixed in the middle of four perpendicular leaf springs. This construction is very stiff in normal direction so that no noticeable worsening of the normal instrument stiffness takes place. There is no height change of the sample during a lateral deformation of the holding springs by a piezo element of in maximum ± 70 µm. Both movements (normal and lateral) are therefore completely decoupled. The force, applied by the piezo element, is independently measured by another spring system where the spring deformation is determined by an inductive displacement sensor (LVDT) without limit stop. A clamp, which can be closed or blocked by a small motor, enables the force transfer to the sample. 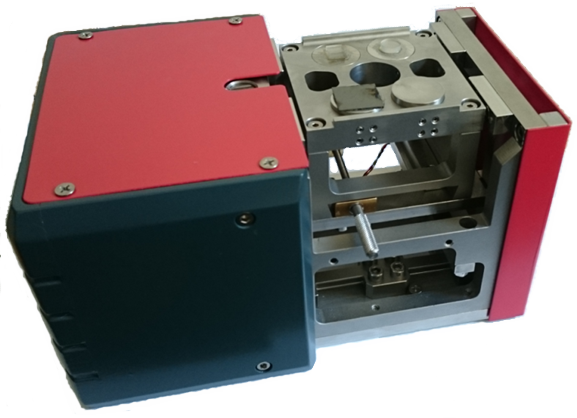 In the blocked position it prevents that the sample holder with the sample can move in lateral direction as it is necessary for hardness measurements. By using this principle a force can be applied and measured even when no lateral displacement takes place (in contrast to scratch testers and other instruments). This is for instance the case when the indenter is adhering on the surface. The transition from sticking to sliding friction can exactly be resolved. For the determination of the frictional force the spring force of the holding springs must be subtracted from the measured absolute force. The exact spring constant is therefore determined before a test series by a measurement against air without contact between tip and sample (figure 3 and 4). The high displacement resolution allows the determination of the elastic deformation in the contact of partially less than 10 nm and therefore the determination of the lateral contact stiffness. The combination of both measuring heads enables a variety of new test methods. Only one of them shall be shown here as example. It is explained in figure 6 and 7. Fig. 4: Lateral measurement curves from figure 3 after correction of the spring force of the holding springs and the lateral instrument stiffness. For the applied normal force of 100 mN the friction coefficient between a diamond sphere and fused silica is 0.08 in both directions. Fig. 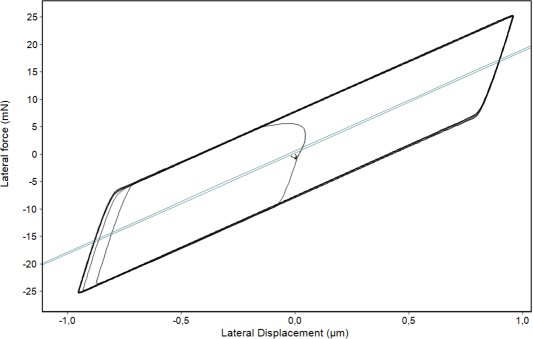 5: Detail at the turning point of cycle 2 from figure 4 with fit curve for the determination of the lateral instrument stiffness. This is a purely elastic deformation within the contact. 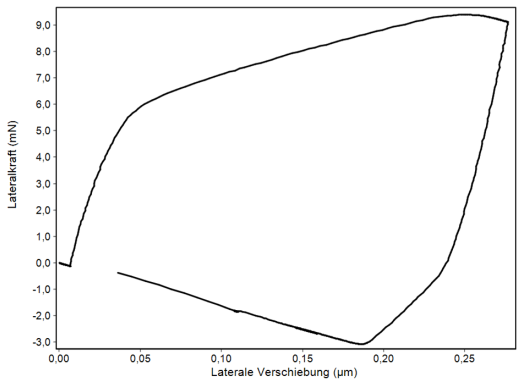 The lateral contact stiffness is 296 mN/µm and the ratio between lateral and normal contact stiffness is 0.965. Fig. 6: Sequence of a combined normal-lateral load-displacement measurement. 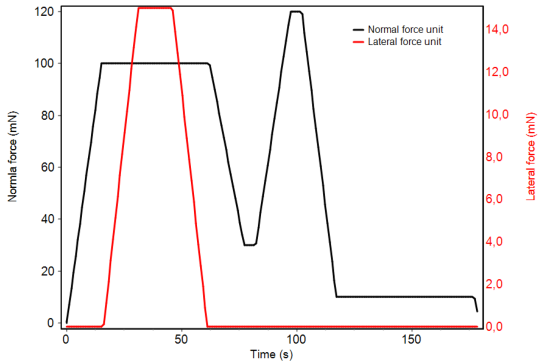 After loading to a first loading step of the normal force a lateral cycle with a maximum lateral force of 15 mN is carried out during the hold period of the normal force. 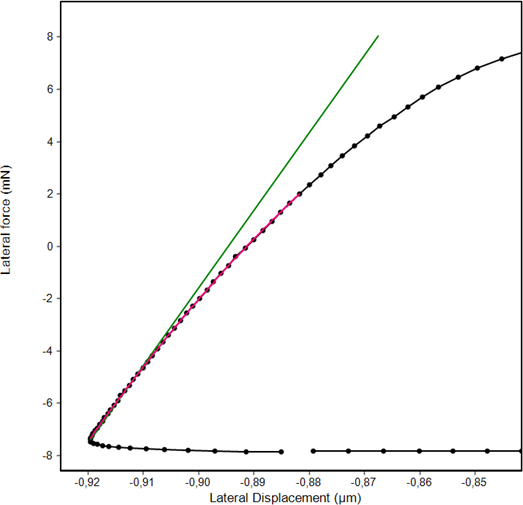 Lateral load-displacement curve of a Berkovich indent in fused silica with the sequence of figure 6. After producing a plastic indent by the normal force the indenter is pressed sideways against the indent walls. 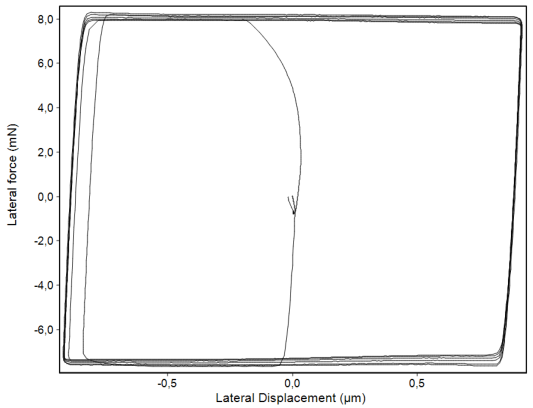 This results first in an elastic deformation of up to about 5 mN lateral force before the sample is also sideward plastically deformed by about 200 nm. The unloading curve to the right is also purely elastic. This can be used to calculate the Poisson´s ratio with a relatively complex model. Further the yield strength and under certain circumstances also the internal stress can be derived. The necessary calculations for that is not part of the InspectorX software. An additional external software is needed.